time 8am to 5pm daily. Educational outings: R35-R40 per learner. A unique Garden Centre situated within a magical garden. Our Garden Centre is a green destination for the whole family that offers far more than just shopping for your gardening requirements, escape the hussle and bussel of the city and come enjoy the peace and beauty of our gardens with the new Starkie's secrecy playground and animal farmyard for the kids to explore, or celebrate their birthday in our fabulous children's theme party venue, Relax and refresh in our rustic country tea garden, mingle and shop in the weekend Trading Post arts and crafts market. Explore and take ideas home from the landscaped display gardens. 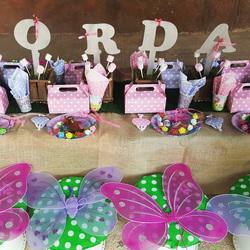 These days many busy parents are opting for party venues. Not only is this extremely exciting for your child, when you consider the cost & time involved in preparing the party yourself, a birthday bash away from home is very appealing. At Garden World we believe in once upon a time & happily ever after, we believe in the importance of fun, laughter, love & creating unforgettable birthday memories & so we created a safe, enclosed, outdoor area. We have farm animals, playground equipment and a jumping castle so that children will have a fun-filled space in which to romp, play and be in touch with nature. Details of themed parties and other requirements must be confirmed a minimum of 14 days prior to party date. Dates are neither held nor confirmed until the full amount quoted is paid, and payments are not refundable. You can contact Delene on 076 805 1260 to book a party or for more information on costings. 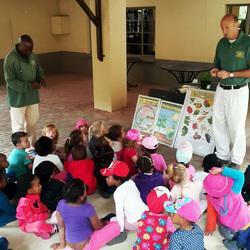 Educational Outings – great educational fun for children to learn about plants & animals in an inspiring environment. We also offer children a variety of educational outings. These are very popular outings. The Hands-on animal experience teaches the children about farm animals and is a wonderful learning experience. We have now introduced a new program on plants (which is most appropriate, as Garden World is a Garden Centre with its own plant growing facilities). This program is also a hands-on experience teaching the children the importance of growing plants. On request Entrepreneurship can be included in this program where we discuss and illustrate the various aspects of growing plants for business purposes. We present the facets of agriculture to the children who visit us, according to the age and development of the child. The children have great fun while gaining education. All the programs are supervised and provide a learning experience, where the children gain knowledge of plant and animal lore. Give your children the magic of touching, loving and feeding tame farm animals. Truly a fascinating experience for toddlers, pre-primary and primary school children. You can contact Garden World on 011 957 2545 or magriet@gardenworld.co.za to book a outing or for more information on costings. Clover Mama Afrika – Ukwakha Isizwe (Building and nurturing our nation) initiative. Clover seeks out women who are making a difference in their communities and who wants to become self-sustainable. These are the women who become part of the Clover Mama Afrika social responsibility investment project and are trained to become proficient in such essential skills as cooking, baking, sewing, crocheting, food gardening and bread baking skills. Over and above the training sessions these women are supplied with the necessary tools, equipment and infrastructure to create an income for their communities. Garden World's Rustic Tea Garden offers a tranquil and outdoor setting where one can enjoy a range of mouthwatering treats; from freshly baked cream scones through our range of delicious home bakes to our burgers with oversized patties, toasted sandwiches, farm- house breakfasts and hot dogs with choice of salads and chips. Our Tea Garden is fully licensed with waiter service offered over weekends and public holidays. We cater for Kitchen Teas, Stork Parties, Group Bookings etc. Garden World adds an essence of Eden to any occasion. 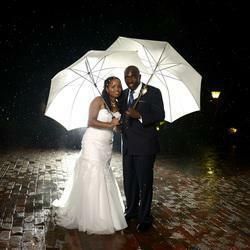 In this tranquil setting, the bridal couple can host the Wedding ceremony and reception of their dreams. 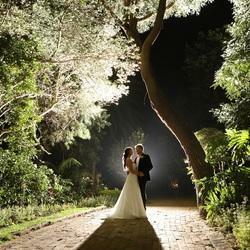 Seal the memories of your special day in fairy glens and romantic gazebos. 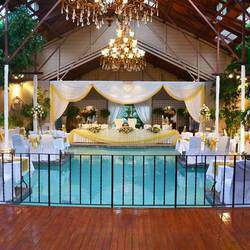 This unique tropical banquet venue surrounds a sparkling indoor pool.